On June 28, San Francisco Pride is going to be awesome for furries! The Bay Area Furries are all ready to march in the parade. 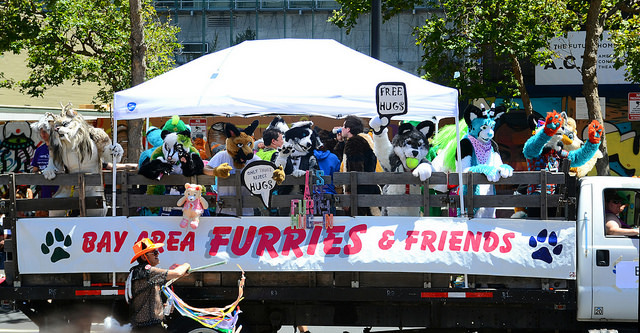 Pride is the height of street fair season in “Furry Mecca”. It’s one of the most loved activities for an active section of the community. 2014 was the first Furry appearance in the parade since 2005. They had attendance of 50+, and TV coverage with a million-strong audience. RSVP’s are 25% stronger than last year, with days left to grow. Two leaders got the event organized, despite unavailability of an important third from last year. Califur visited by television naturalist Figgy Dobbs. An Inside Look at the Furries in Their Natural Habitat! Buzzfeed podcast covers furries (via earthfurst). BuzzFeed’s Internet Explorer does “A Deep Dive Into Furries”. It starts at 6:45. I missed this in April. It calls furries “the greatest mystery of the internet”. As usual, Buzzfeed is a dubious source – it mentions FurryMate but overlooks their bots. I won’t forgive them for spreading lies about the NJ FurBQ Hoax.